With the Sochi Winter Olympics coming to an end, sports enthusiasts can now begin to focus on college basketball's March Madness. For investors though, last week's holiday shortened trading saw the S&P 500 Index close down fractionally. This felt like a win after January's market decline and subsequent rebound in February. All eyes continue to be on the Fed as they continue to taper QE activities. One article link in the magazine looks at the fact the Fed purchased over 70% of the net issuance of Treasury securities in 2013. One question that arises is who will become the new buyers of these Treasury securities as the Fed reduces its QE. Below is the link to this week's magazine with articles investors may find of interest in the week ahead. A few of the articles noting this issue of so-called peak corporate profit margins can be read below. Note the date in which the articles have been written vis–à–vis the equity market's performance. "A profit margin is commonly defined as profits divided by revenues. GDP is an aggregate expenditure in the economy, which is definitely not equal to aggregate corporate revenues. It is reasonable to expect that profits as a share of GDP and profit margins are correlated but they are not the same thing. A meaningful ratio would instead divide profits, which is the income of corporations, by total income in the economy. This new ratio I interpret as the share of total income that goes to corporations: not the profit margin, but the profit share." "My second point is that the number in the numerator of the “profit margin” on the chart above comes from national income figures. It includes profits generated by corporations with legal residence in the U.S., regardless of whether those profits came from U.S. operations or foreign operations. This measure of profit includes income earned by Amazon in the United Kingdom, and excludes income earned in the U.S. by Toshiba. GDP, on the other hand, captures economic activity within U.S. borders, whether it is done by U.S. companies or foreign companies, and excludes activity by U.S. companies abroad. 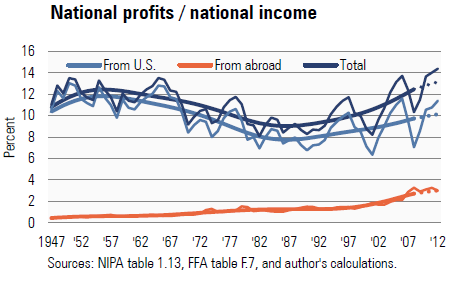 It is misleading to compare these two magnitudes: worldwide profits of U.S. corporations and GDP generated within U.S. borders." "To be more specific, I have estimated the trend of my two time series, foreign and domestic, of the profit share. As of 2008, the last year for which I estimate the trend, the "normal" (i.e. trend) profit share was 12.5%. 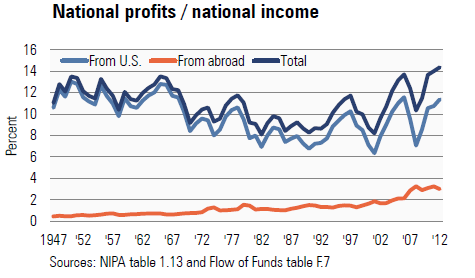 If it had continued rising at the same pace as it did in 1988-2008 as of 2012 the "normal" profit share would be 13.2%. The actual profit share was 14.4%: still too high, but by 9%, not by 70% as Hussman says (last chart below)." 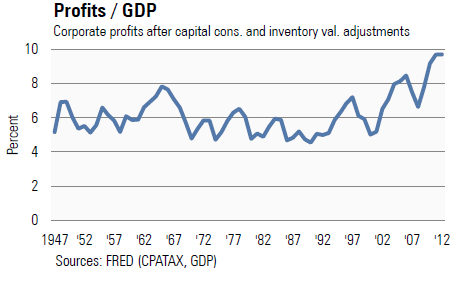 The conclusion of Torralba's report certainly notes corporate profits can not grow forever. He validly notes that segmenting profits generated domestically versus those international are important, especially due to the improving economic picture in Europe, or at least not appearing to be worsening. "Buybacks have been the rage, but companies are going to have to spend 30% more to buy back the same number of shares in 2014 as they did in 2013 (since prices have gone up). The share count is more relevant to EPS, and on that count, we are seeing a greater number of companies reducing their share counts, which is providing a tailwind to earnings. Apple Inc., which holds the quarterly record of $16 billion in buybacks posted in the second quarter of 2013, already purchased $14 billion in the first two weeks of January." A post we wrote yesterday after the market close noted the similarity of the S&P's recent market pattern to prior chart patterns. One market technician I follow is Charles Kirk of The Kirk Report. I have found Charles' technical analysis as some of the best. I am summarizing here; however, he believes chart patterns provide important insight into the market's near and long term direction. Today he linked to our article from yesterday and made the comment to his readers to note the recency bias in our analysis. At HORAN we do believe investors should be aware of the recency effect in there investment decision process. Absent from yesterday's post was a discussion on the longer term view of the market. In that regard, below is a 5-year chart of the S&P 500 Index using a weekly view. 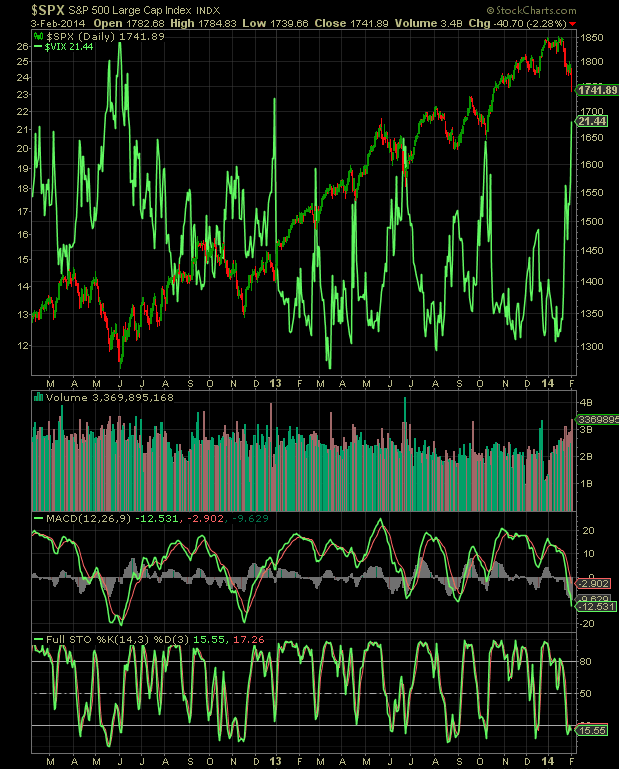 It is our view that the market remains in a bullish posture on a long term basis as well. Certainly, short term volatility is likely to influence near term price action, but our view is the market can continue to grind higher, even from these levels, all else being equal. 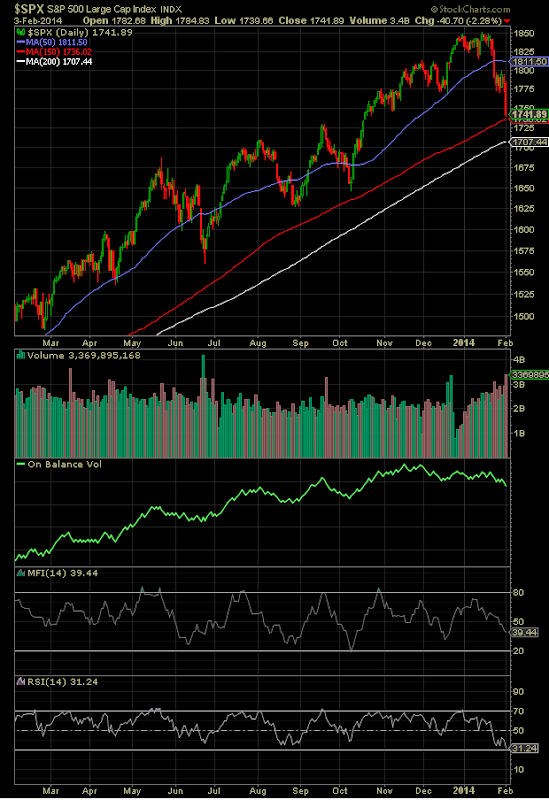 A Market Consolidating Before New Highs Ahead? Year to date the S&P 500 Index is down approximately 1% on a price only basis; however, for investors, the start of the year has been anything but a smooth ride. Through early February the S&P 500 Index declined almost 6% before recovering most of the loss these past several weeks. The question for investors is what lies ahead for the market. For traders, and not necessarily longer term investors, some consolidation of these recent gains would be healthy for the market, but maybe this early February decline was the consolidation. The first chart below displays several technical indicators relative to the S&P 500 Index on a "daily" basis. As can be seen from the chart, the most recent chart pattern has played out a number of times over the past year. The second chart uses a weekly time frame. 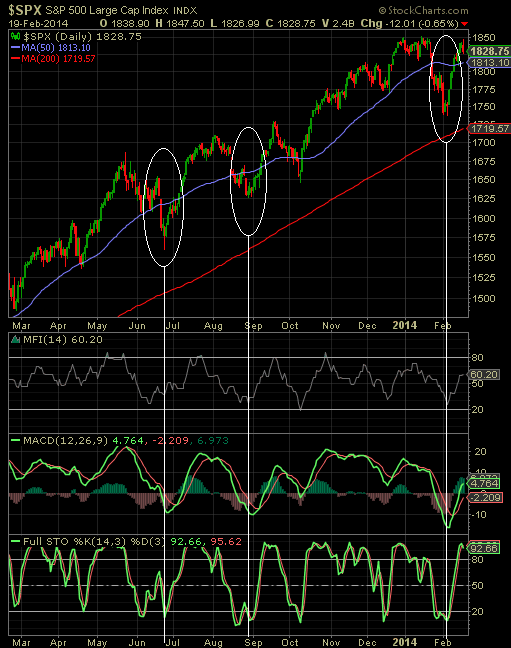 Both of these charts taken are suggestive of further market highs ahead, keeping in mind the daily chart still indicates an overbought market based on the full stochastic indicator. One aspect of the market this year that could unfold is a more "sell in May" type of year. 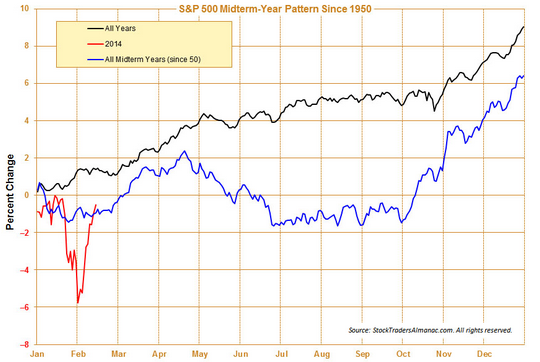 Seasonally, the "sell in May" strategy has rewarded investors, but this was not the case in 2013. The market action so far this year though is resembling that sell in May type of environment on top of which this is a mid term election year. Monday was a holiday in the U.S. so investment markets were closed. This one day holiday provided investors some relief from a market that is only six weeks into 2014. Investors have navigated a volatile equity market beginning with a January where the S&P 500 Index decline 3.46% and so far in February the price only return for the S&P 500 Index is a positive 3.14%. It seems these mid single digit market pullbacks are becoming more the norm than the exception. From an earnings perspective, fourth quarter 2014 earnings growth is averaging a little over 8% according to Factset Research. The one area of weak growth for the 387 companies that have reported is on the revenue side. S&P Dow Jones Indices is reporting that revenue growth is approximately 1.2%. Below is the link to The Week Ahead magazine with timely topics for this shortened trading week. As the below table shows, the dividend payers in the S&P 500 Index did not hold up so well during January's market correction. The January average return of the payers equaled a negative 3.54%. The non-payers generated a positive return of .40%. Historically, dividend paying stocks generally hold up better during market corrections. This has not been the case over the course of the last year and a half though. We have touched on this topic in a few earlier posts, focusing on the fact traditional bond investors may be purchasing dividend paying stocks due to low bond interest rates. It may be the case that traditional bond investors, purchasing "bond-like" stocks, have less of a tolerance for declining equity prices. A result is they may be quick to sell these dividend payers at the first sign of equity market weakness; hence, the weakness exhibit by dividend paying stocks in recent market pullbacks. A few questions have come up regarding the similarity of today's market chart pattern relative to the chart pattern in 1929 just before the crash at that time. The chart that has been circulating is similar to the one below that was created by Ryan Detrick, CMT of Schaeffer’s Investment Research, Inc. However, Ryan included another important chart that investors should view in conjunction with the above chart. His second chart displays both charts on a percentage change basis. When looking at this second chart below, one sees a very different picture of this market vis-à-vis the 1929 market. The Wall Street Journal's sister publication, MarketWatch, contained an article yesterday that displayed only the first chart. The MarketWatch article does discuss the percentage change chart; however, in my opinion, places more emphasis on the first chart above. Evaluating data from a percentage change perspective is critical in our view. For example, a company that grows earnings from $1 to $2 per share has a 50% 100% increase in earnings growth. A company that then grows earnings from $10 to $11 experiences a 10% earnings growth. All else being equal, both increased earnings by $1; but, what company would an investor rather own? Employment Growth Key To Economy Achieving "Escape Velocity"
One frequently cited aspect of this recovery has been the slow pace of economic growth since the end of the recession and the negative impact on employment growth. We have often referred to this as bump along the bottom economic growth. Is there an underlying cause contributing to this slow pace of economic growth? At HORAN we believe there is, but let's look at some of the economic data. The final GDP report in the third quarter of 2013 was reported at an annual rate of 4.1%. The first read on GDP for the fourth quarter was reported at a lower 3.2% annual rate. The U.S. Department of Commerce's BEA estimates GDP for all of 2013 equals 1.9%. This is lower than the 2.8% reported for 2012. As the below chart shows the slow rate of growth since the end of the financial crisis has created a 15% gap versus the economy's long term potential growth rate. A consequence of this below trend growth has been a stubbornly high unemployment rate. The unemployment rate has declined, yet this recovery has not resulted in employment reaching the level prior to the recession as the two below charts show. In January the unemployment rate declined to 6.6% while the broader U-6 rate equals 12.7%. Notable in this recovery is the fact the corporate sector has been performing well. The strength of the stock market since the bottom of the recession is one confirming data point. Just looking at corporate net cash flow and corporate cash flow as a percentage of GDP, both are at elevated levels. For companies to exhibit a high level of cash flow is a positive. A high level of cash flow as a percentage of GDP is not a positive when economic growth, or GDP, is below trend level. The green line in the below chart shows the strength of corporate net cash flow. If the economy were growing at a trend growth rate, cash flow to GDP would equal 12.4% as denoted by the maroon dot. 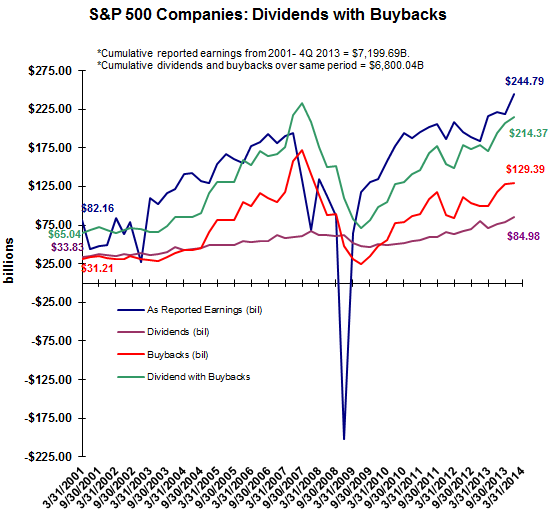 Companies have been using this flow to reinvest in their business, increase dividends and increase stock buybacks. Non residential fixed investment, a GDP input defined as expenditures by firms on capital such as commercial real estate, tools, machinery, and factories, has surpassed the level prior to the recession. And on a percentage change basis, the peak growth following the recession matches the level achieved subsequent to prior recoveries (see below chart.) Of concern is this reinvestment rate is slowing to levels reached prior to the onset of past recessions. "In the past, there was a fairly close contemporaneous relationship between capacity utilization and unemployment. However, much like the relationship between output and unemployment, a lag in the relationship has developed in the last two recessions (see graph). That is, in past recessions an upturn in capacity utilization was matched by an upturn in employment, there was no delay in the relationship, but in recent recessions there has been about a half year delay before unemployment reacts to changes in capacity utilization (or perhaps even a bit longer)." As the above chart shows, the capacity utilization rate has finally broken above a resistance level that began in 1998. This higher capacity utilization is a positive for employment and we believe it is this increased level of hiring that can push the economy into its so-called "escape velocity." But what might be restraining hiring by companies? There is some debate whether small businesses create more jobs than larger businesses. It is universally accepted that small businesses are responsible for a significant portion of new job creation. However, when looking at business failures, and thus, net jobs created, studies indicate small businesses do not have a decided advantage. Interestingly though, the National Small Business Association recently released its 2014 Healthcare survey. The survey notes that 96% of the small businesses surveyed have been in business for more than six years. The entire survey provides interesting insight into the small business operator's view of the current economic climate. Fully 34% of those surveyed noted they are holding off hiring due to the uncertainty around health care regulation. 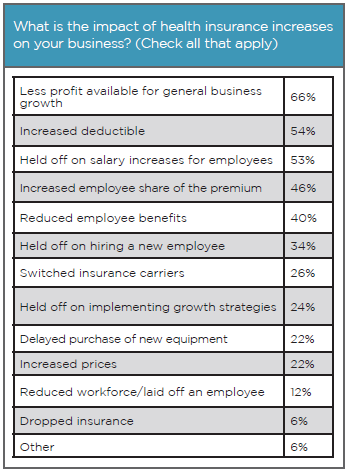 Additionally, 24% are holding off the implementation of strategies that would improve the growth of their firm. In addition to the uncertainty surrounding the Affordable Care Act, increased regulation under Washington's oversight has made it more difficult for new businesses as well as existing ones to expand. If issues with health care reform could be resolved as well as reducing the regulatory burden on companies, a higher level of employment would likely follow. We have discussed on our blog a number of times about the broad based benefits of higher private sector employment. But having policies in place that are favorable to businesses could certainly push the economy into its "escape velocity." Last week the lower than expected ISM manufacturing report on Monday caused investors to sell stocks and saw the S&P 500 Index decline over 2.2% or nearly 41 points to close at 1,741.89. The market traded sideways Tuesday and then Wednesday the market traded below the low reached on Monday early in trading. From that point on the market rallied for the balance of the week, in spite of a below expectations job report, and ended higher by 3.2% from the closing price on Monday. Some strategists are highlighting that the January Barometer may play out this year. As this indicators notes, "so goes January, so goes the rest of the year." This week's magazine contains links to this phenomenon as well as links to articles on thoughts for the upcoming week. 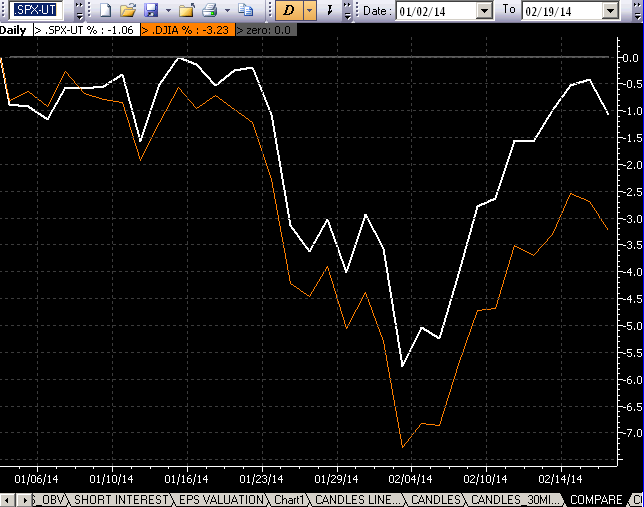 Year to date the S&P 500 Index is now down 5.76% and the down Jones Industrial Average is down even more at 7.26%. These declines are reminding investors that the market does not always move higher unlike what seemed to be the case in 2013. The question that is top of mind now is whether this pullback is the beginning of a bear market where the market declines over 20%. As we noted in our post earlier today, at this point in time we do not believe this magnitude of a correction will play out. Many strategist are pointing to issues in the emerging markets as the root cause of the current market pullback. 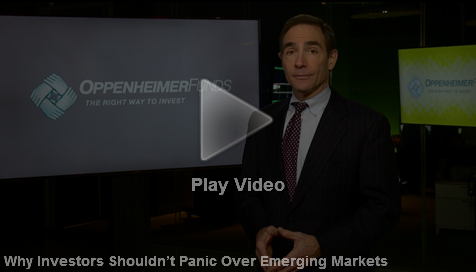 The short video link below by Oppenheimer Funds discusses the differences between today's emerging market situation and the Asian Financial Contagion in 1997. With the correction in the U.S. markets that has been experienced to date, an oversold condition has developed. Volatility as measured by the VIX Index has spiked to 21.44, a level last seen in June of this year when the VIX was at 21.91 and late in 2012 when the VIX reached 23.23. As the chart below shows these levels did represent market turning points. The next two charts show the percentage of S&P 500 Index stocks that are trading above their 50 and 150 day moving averages. As evidenced in the charts, oversold levels are indicated. 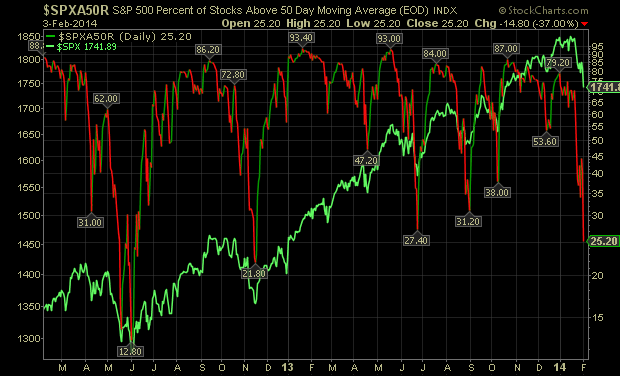 For the 50 day moving average, only 25% of S&P 500 Index stocks are trading above this average. And for the 150 day M.A. 52% are trading above the respective average. Certainly, these percentages can decline further; however, these levels are an indication of an oversold market. 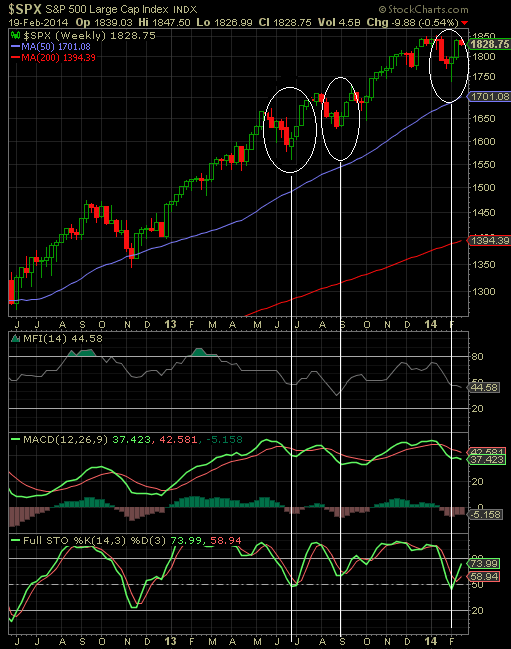 Lastly, the below chart displays the S&P 500 Index along with several moving average measures. 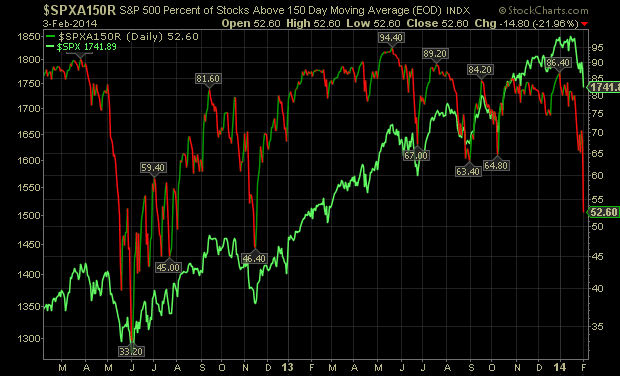 Notable in the chart is the S&P 500 level relative to its 150 day M.A. The 150 day moving average has represented a critical support level for the market as prior tests at this level have seen the market bounce. This level is S&P 1,736 or a little more than five points below today's closing level. Additionally, the Fed has a moderate open market operation on Tuesday (2/4) of up to $2.75 billion, a large liquidity injection on Wednesday and smaller purchases Thursday and Friday. The Tuesday Fed liquidity injection may provide for a Tuesday jumper type trade as was common place in 2013. I began writing this post several weeks ago when equity markets around the globe succumbed to profit taking. Much of the catalyst was attributable to currency issues in a number of the emerging economies with the China PMI report tipping the scales toward this profit taking environment. China's PMI report last month indicated that the country's manufacturing economy had contracted in January versus the report in December. The China January PMI was reported at 50.5 versus 51 in December. Industrial output fell below 50 at 49.5 versus 50.5 in December. This morning China's non-Manufacturing PMI declined to 53.4 versus 54.6 in December. Readings below 50 indicate contraction. As can be seen in the below chart, readings below 50 have been more the norm than not since 2011 so why all the concern now? Then this morning the U.S. manufacturing PMI came out and was weaker than expected but still indicating expansion. As the below chart indicates the PMI has been in expansion since the end of the most recent recession except for November 2012 when the PMI reading was 49.5 and we know how the market performed in 2013. "An emerging meme posits that the recent weakness in quite a few emerging market currencies (e.g., Argentina, Venezuela, Brazil, Chile, Turkey) is a replay of the S.E. Asian currency crisis of 1997-98, and as such this may persuade the Fed to back off on its intention to continue its QE taper. I disagree, because there are some very important differences between now and then." The Grannis article highlights the issues that have been developing in some of the emerging countries that led to recent currency weakness and is a good read for investors. We believe investors should evaluate these emerging market developments in the context of overall economic activity around the globe. It is not uncommon, or better yet, it is normal for economies to transition from a recovery phase, an expansion phase and ultimately a contraction phase. Importantly, investors should evaluate where the various economies around the globe fall in respect to the economic cycle and allocate investment dollars within their portfolio based on these conclusions. At the end of 2013, Fidelity research estimates several of the major global economies reside in positions within the economic cycle as noted below. The implications of this transition to different phases of the economic cycle are important for investors as they allocate equity funds to the sectors that will benefit the most or least from the specific phase of the cycle in which the economy may reside. This is not a clear cut metric though; however, it is helpful in guiding ones investment allocation. We wrote about this in early 2011, Sector Rotation And The Economic Cycle, and provide a link to a Fidelity white paper that contains a more in depth discussion on this topic. Because these sector transitions are not clear cut, at HORAN we review a number of variables one of which is earnings revisions by analyst. As the below table shows, the largest positive revisions have been in the Utilities and Telecommunications sectors. For the month of January, from a sector contribution perspective, both of these sectors were top three in terms of contribution as detailed in S&P's January Index Dashboard report. Looking ahead, investor should take some comfort in Q4 2013 earnings reported by S&P 500 companies to date. A total of 249 S&P 500 companies have reported to date for the fourth quarter. There seems to be quite a bit of chatter about companies lowered guidance going into Q4 so this lowered expectations. Yet, the blended earnings growth rate for Q4 is running at 8.9%. When the quarter began, earnings growth was expected to equal about 7.5% as we noted in our Q4 Investor Letter. In short, we believe companies have been performing pretty well. More importantly, we continue to focus on the forward guidance provided by these firms. The first read on fourth quarter GDP was reported last week as well. Our belief is U.S. economic growth, GDP, continues at a steady but not over heated pace. The first read on GDP was an annualized 3.2% which is down from 4.1% in Q3 2013. Looking at important components of the GDP report, specifically the consumer, there were some positives. Since the consumer accounts for 70% of GDP, Econoday’s conclusion, “While the fourth quarter was moderately healthy on average as measured by GDP, monthly data showed softening late in the quarter — notably for manufacturing and housing. However, the consumer appears to be a little more optimistic and the consumer sector may be carrying the economic load over the next few months. So fundamentally, U.S. companies are performing relatively well and we think this continues through 2014. Volatility will undoubtedly continue this year, which seemed to disappear in 2013. From a market technical perspective, a correction or consolidation phase is healthy and we do believe the recent focus of the selling is an excuse by investors to take profits in some of their equity position. Additionally, some institutional and hedge fund type managers probably have been caught of guard with the decline in interest rates in the U.S. As a recent article on Business Insider notes, All of the Turmoil In Global Markets Right Now Is Just One Gigantic Hedge Fund Short Squeeze. This past week's market was a continuation of the weakness exhibited in the first three weeks of January. A couple of the factors cited for this weakness are emerging market issues specifically related to currency weakness, the continued tapering announced by the Fed, an economic slowdown in China and a underwhelming job report in the U.S. All of this has increased the negative sentiment associated with the equity markets globally. This week's magazine contains a number of articles on bearish sentiment as well as articles impacting the emerging markets. One of the sentiment articles in the magazine points to seasonality in February that highlights that the first week of the month is generally a positive returning one. We will certainly see what plays out this week.